She had seen that clouded look before, a determined mix of pity and revulsion and something else she could not define. It was there and then gone in an instant, like that first surprising zing of life she had felt in her belly all those months back. She had seen that expression nine times in her thirty-one years, and every time, it meant one thing: that he was leaving. Now, with that little grim-faced gangster squalling in the bed next to her, crying for the milk that seeped from her swollen breasts, she knew that she had never deserved it more. Michael had promised he would stand beside her, and never go below the waist. There would be tearing and stretching and blood, and she was afraid he would never want to touch her again. He had kept his word during twelve hours of labour, holding her hand as she cursed and wept with the rolling of the contractions. He fed her ice chips and mopped sweat from her brow when she vomited into the plastic bedpan. But when it came time to push, he had grabbed the camera from his overnight bag, and stationed himself beside the doctor at the foot of the birthing table. The baby was fever-bright and ugly, and reminded her of a shrunken squint-eyed zayde or a tomato can boxer who’d taken one too many lumps in the ring. Through the uprights of her numbed legs, she could see Michael reaching out for the thing, scissors in hand to cut the cord. And then she saw it, as the sustaining jellyfish of her placenta slid onto the table, behind the sympathetic glow of his smile, something ever so subtle changed in his face, the shift just long enough for her to register. The baby had fallen back to sleep as suddenly as it had woken, and through the hum of the baby monitor, she could hear the static-crossed conversations of neighbors on their cordless phones, whispered ghosts reaching out from an undertow of darkness. In the empty place in her belly, she felt the undeniable truth that while she had been sleeping, her husband had left her. She called to him, but was answered only by the swish of broken souls crackling through the monitor on her dresser. “Michael! ” she called, louder this time, her rising voice tossing the baby in his fragile sleep. She climbed out of bed, pulled her robe tight around her, and went downstairs. The living room was empty. Through the bay window, she could see that bright snow was falling in the street. She stood for a long time, desolate, her face pressed to the cold glass as the snow fell before her. She felt a familiar sense of anger, shame and loneliness, but she would not let herself cry. Not again. The TV was on in the basement, tuned to a hockey game. She unlatched the baby gate and crept down the carpeted stairs. Someone was sitting on the couch. He looked familiar to her, but had changed over the years. She considered the mathematical possibilities that Daniel would show up in her basement after all this time, and her jagged formula only increased her certitude that it was him. One time, they had kissed in the falling snow, a fat flake melting on his long eyelashes as he told her that he’d found a real girlfriend who was prettier and would do more than just french kiss him. He had sat behind her in history class and kicked at her chair whenever Mr. Gillick faced the blackboard. He looked so old now, his face creased with concern, his hair greying at his temples. What sweet revenge that he had aged while she had stayed the same. He stepped forward to embrace her and she pushed him away with a force that was surprising even to her. Now, he spoke very slowly and deliberately, as if he really were afraid Amy was going to rat him out to his new girlfriend. She sat shivering with an inexplicable heat, and squeezed her eyes together to force Daniel from her mind. When she opened her eyes later, she was reassured by the sight of her father’s familiar oversized hiking boots standing sentry by the back door. She heard footsteps through the baby monitor and climbed the stairs. Her father stood in the centre of the bedroom, rocking the baby in his arms. He had not shaved and the placid look on his face mocked her. “The baby’s dead,” she said flatly. As if solely for the purpose of humiliating her, he unwrapped the wailing pink thing and held it out to her. Its thin little legs were folded up into its body like a frog waiting to spring. “You switched him with someone else. That’s not mine. That creature is not mine. Not mine,” she sobbed. “Get that thing away from me,” she said, pulling away from him. “You smell like vomit,” she said. She felt fear tightening in the back of her neck at the possibility that she had no idea who this man was. She felt ridiculous and suddenly very delicate. Her heart beat fiercely in her chest. But it was David. She was certain, because of the arrogant way he cocked his right eyebrow when he thought he was right. Amy rushed to the bathroom and closed the door, her thoughts overrunning each other in searing waves. She knew he was going to burst in any minute, so she scrambled through the medicine cabinet until she found the crumpled cardboard box with the last remaining test. She peed on the stick. If she could prove to him that she was carrying his child, he could never leave. The devastating result appeared moments later in the form of an X in the tiny window. She curled up on the floor beside the toilet and through the heating vent, overheard him talking on the telephone about emotional stress and strange, frightening behaviour. She knew what she had to do. The baby lay bundled in a green blanket beneath a simple black-and-white mobile that provided the effect of M.C. Escher’s flying birds gradually transforming themselves into swimming fish. He was hot like coal from the fireplace and she tucked him under her arm and inched towards the top of the stairs. Amy heard something about antipsychotic medications, whisper-shouts into the mouthpiece of the telephone, as she slipped past the kitchen and unlocked the front door. The snow continued to fall from the sky in sticky, thick clumps and she stepped out onto the icy pavement in her bare feet. There was one thing she had to do and that was run as fast as she could. 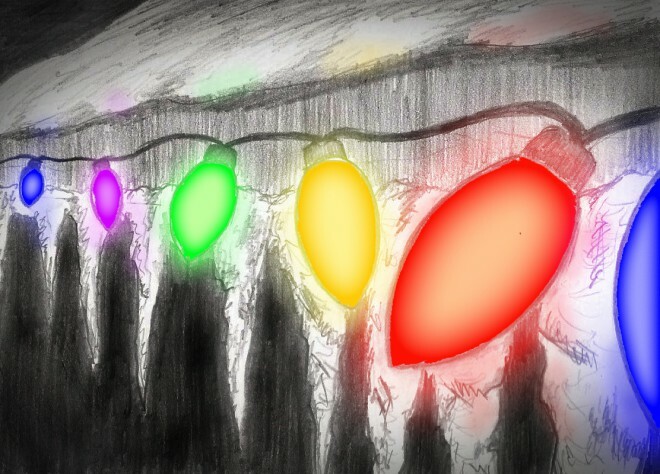 By the time she reached the end of the street, she’d counted six houses that still had their Christmas lights burning. A half-inflated Santa Claus bobbed lethargically in the wind. If only she could find her house, her mother would be waiting with hot cocoa and a cozy blanket; she knew it was around here somewhere, but in the storm, she could no longer tell which way she was running. The bundle she clutched in her arms was howling, and something told her that if she could just dump it in a snow bank, she could fly through the frozen streets unburdened, right into the warmth of her mother’s kitchen. She found a sharp drift of snow and began digging out a hollow with her free hand. The bundle shrieked and squirmed in her other arm. A car pulled up behind her, honking its horn. She shivered, her clenched fists raw. She wanted to run, but her legs were stiff with cold. The wind had risen; it seemed to be getting more frigid by the instant. As she stood in the blowing snow she wondered how she had arrived here. She felt a terrible anguish grip her chest. What she had done? Jonathan Papernick is the author of three books including the acclaimed short story collections The Ascent of Eli Israel and There is No Other. He is currently Senior Writer-in-Residence at Emerson College in Boston and is at work on his second novel, The Sunday Synagogue Softball League, and his third collection, Gallery of the Disappeared Men. His work can be found here. See more, including free online content, on Jonathan Papernick's author page. See more, including free online content, on David Milano's author page.